After getting out of work at 8 am, I made the snowy drive to my destination. 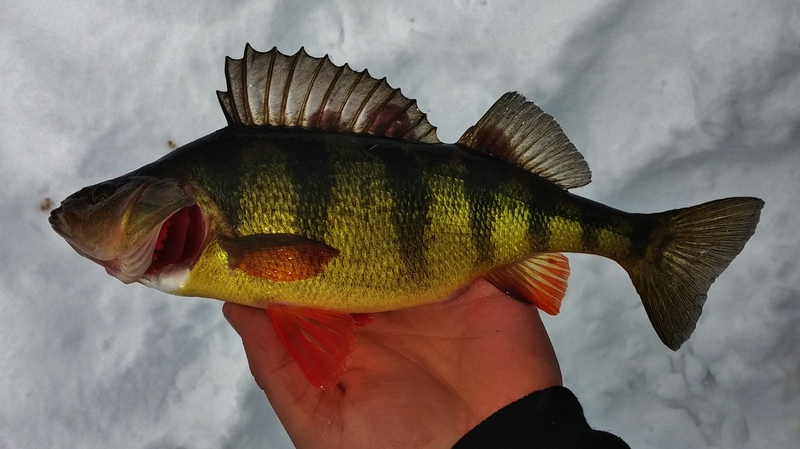 While I had already missed the morning perch bite, I was determined to figure out a way to pick at a few mid day. 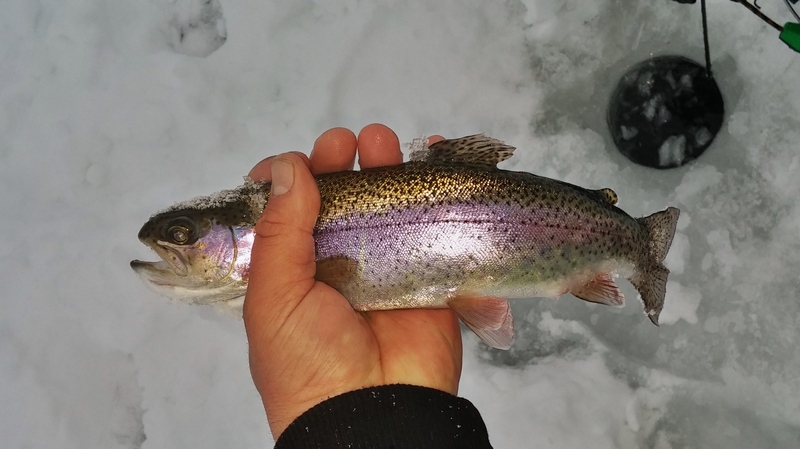 After grabbing fatheads and rigging up several rods with a variety of presentations, I trudged through 8″ of snow to get over deep water. 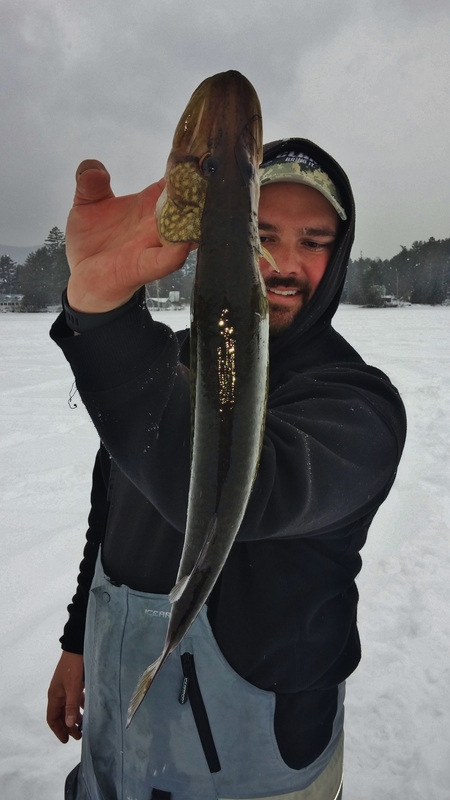 The snow was still flying and for the first hour, the fish weren’t biting. I tried big, small, flashy, and dead sticking. Nothing seemed to work any better than old faithful; the drop shot rig. While I didn’t pick many fish, the ones that I brought topside were quality. After about 3 hours of slow going, I decided to change up my target species and go shallow for bluegill and pumpkinseed. 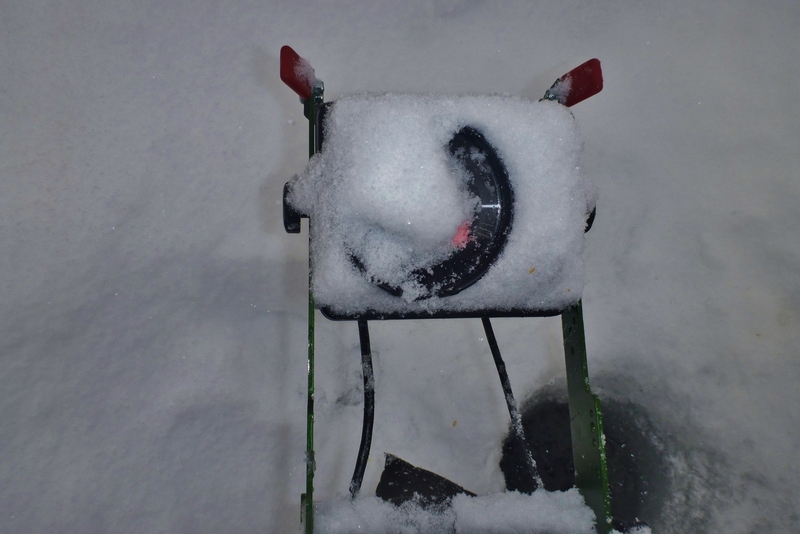 When I got shallow, the snow was quite a bit deeper due to the wind that was blowing it all in. 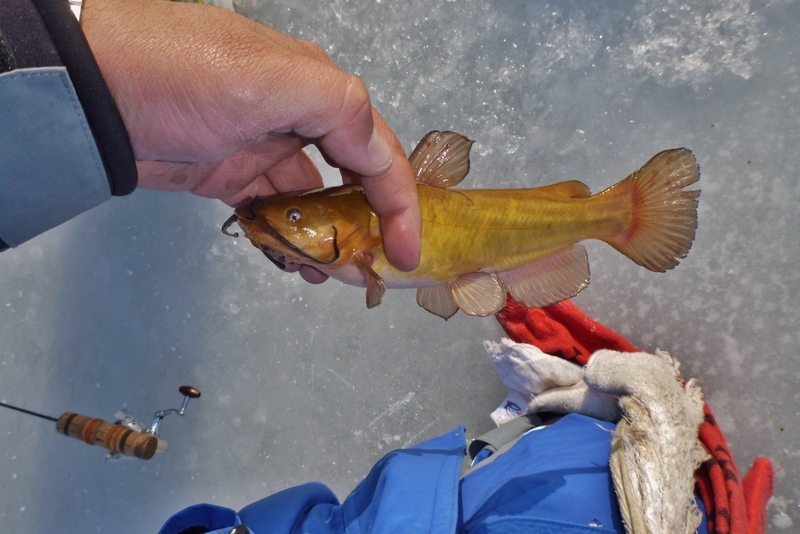 I spread my holes wide over a weedbed with intentions of punching more when I found the fish. It seemed to take quite a while to find any concentration of fish. Two or three out of one hole was good. Around 2, the roads had worsened significantly and I contemplated heading home. As a long shot, I said one more set of holes that paralleled the weed edge. This is where I found the best size class, as well as the best numbers. They were aggressive charging up 3 or 4 feet my intercept my dropping jig. 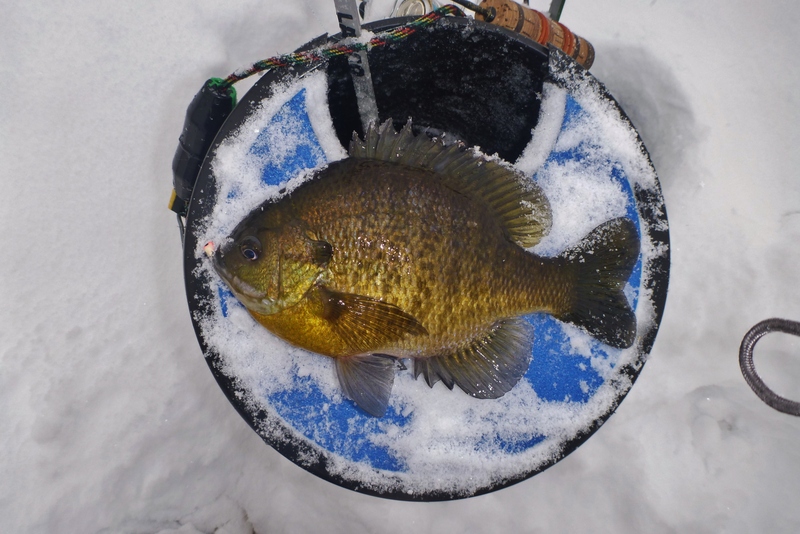 By the end of the day I had pulled 5 bluegill that were 11″ as well as many in the 9-10.5″ range. Can’t complain with a day like that! I fished with a buddy today at a spot that I usually stay away from because of the trek in. With hopes of suspending crappie and some pike on tip ups, the walk in wasn’t so bad! 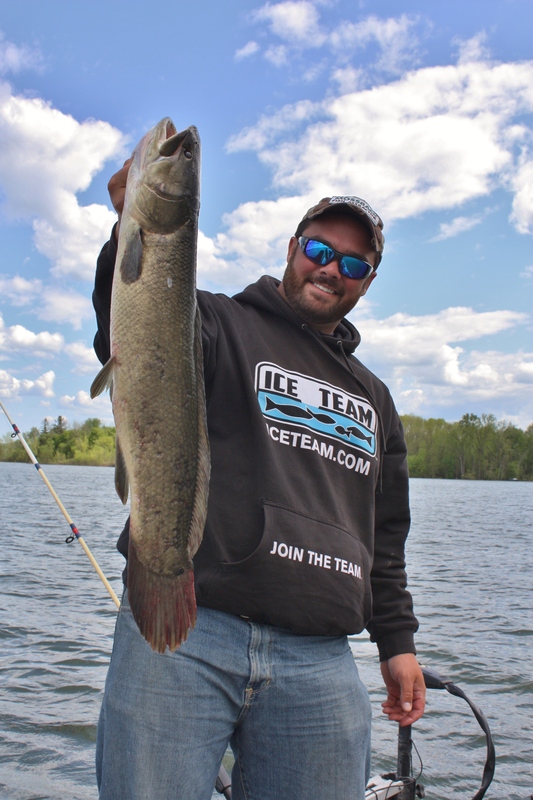 The action started off with a pickerel before we got our spread of flags out. With short bursts throughout the day, We both stayed warm chasing the action down. 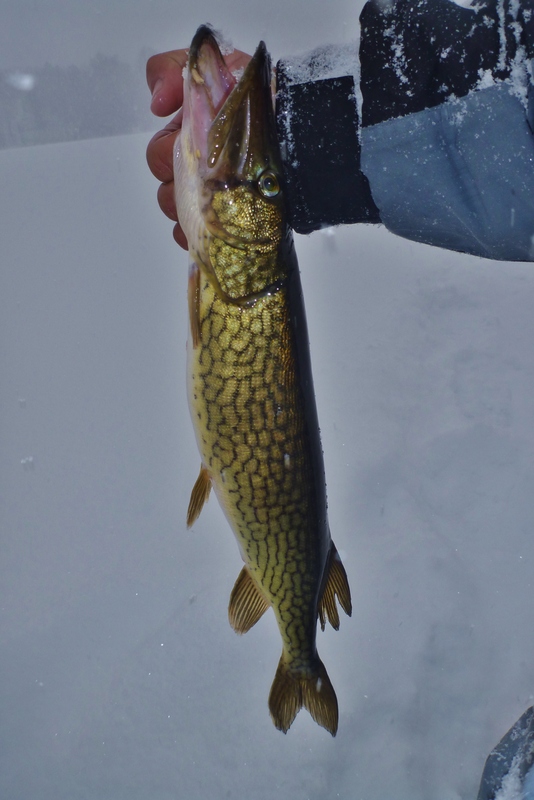 We both caught some decent pike, pickerel, and bass but nothing overly large. 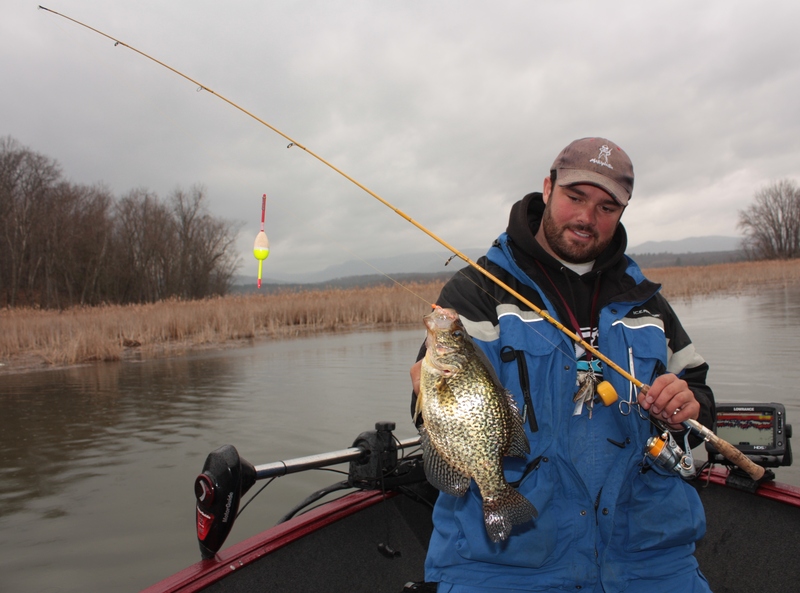 The crappie on the other hand were almost non-existent. Mainly in the deep water were bluegill, pumpkinseed, bullhead and perch. 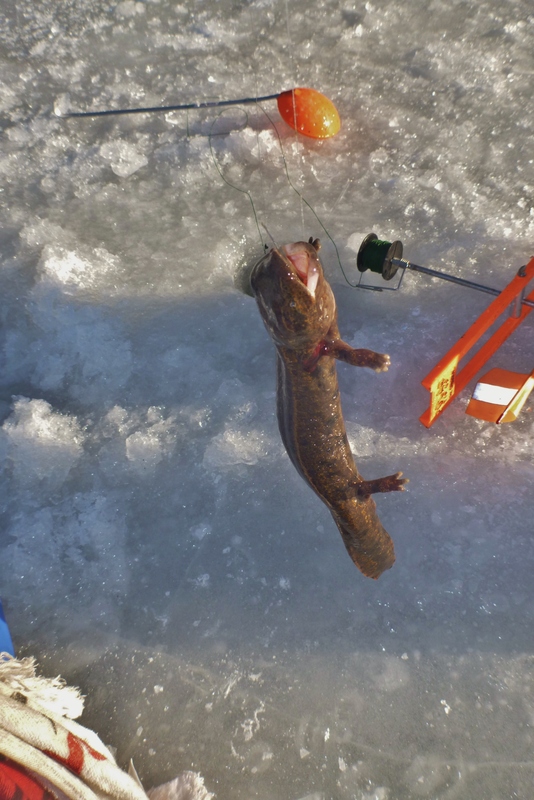 Can’t forget about the mudpuppy too! 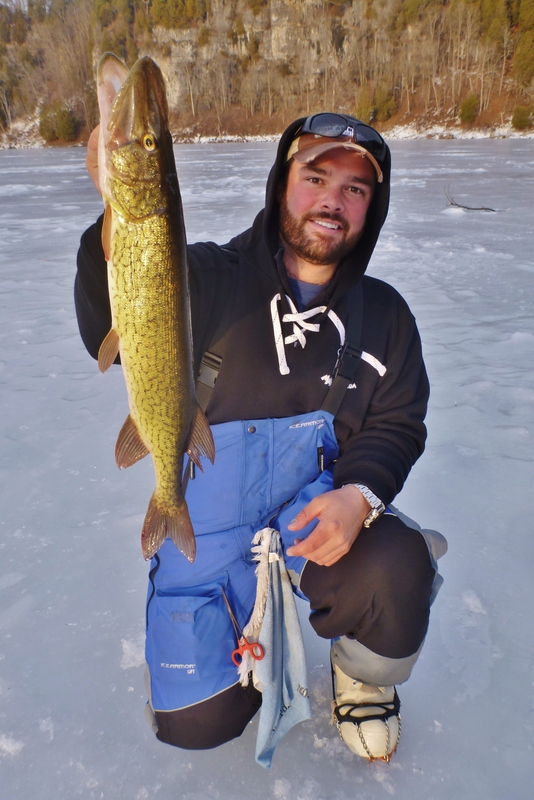 It seemed like the pickerel were in less than 7 FOW, the pike were 7-12′ and the bass were deeper. As the sun started to set the cold breeze really sunk in and forced us to pack up and head for home. 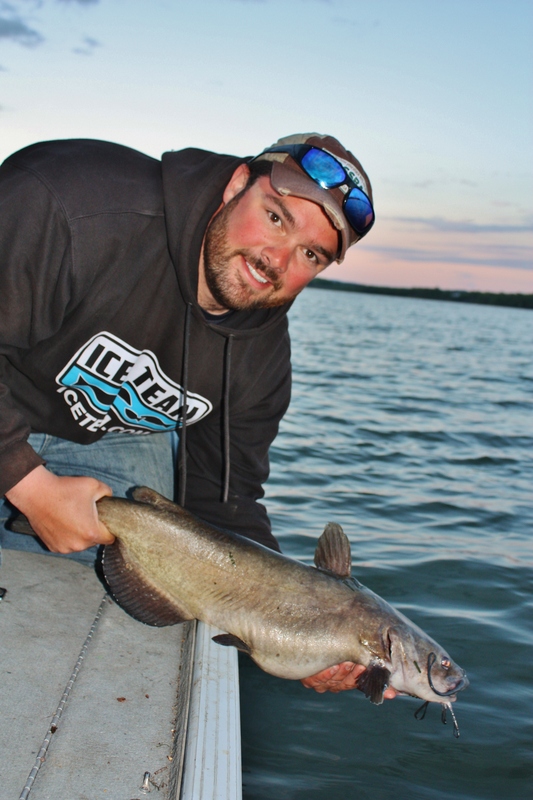 With the month of June upon us, we were anxious to hit the river for walleye on wood. Last summer we developed a great pattern for numbers of quality fish. We found fish on deep wood. 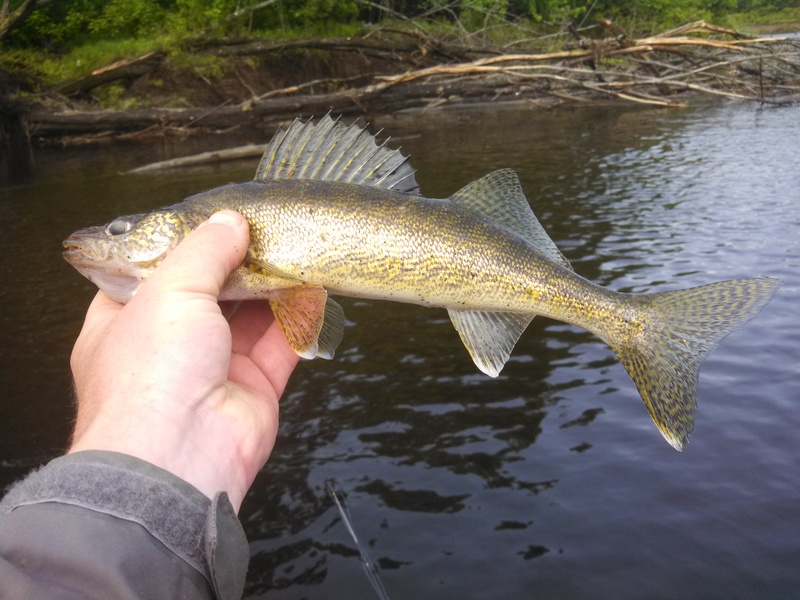 (Walleye In Wood Part I and Part II) After closely watching the river flow and dam forecasts, we noticed that we would have a small window in the early morning when the dams would have been closed. That little bit of time would allow us to get in a few hours of fishing. The current is the deciding factor when fishing the river. 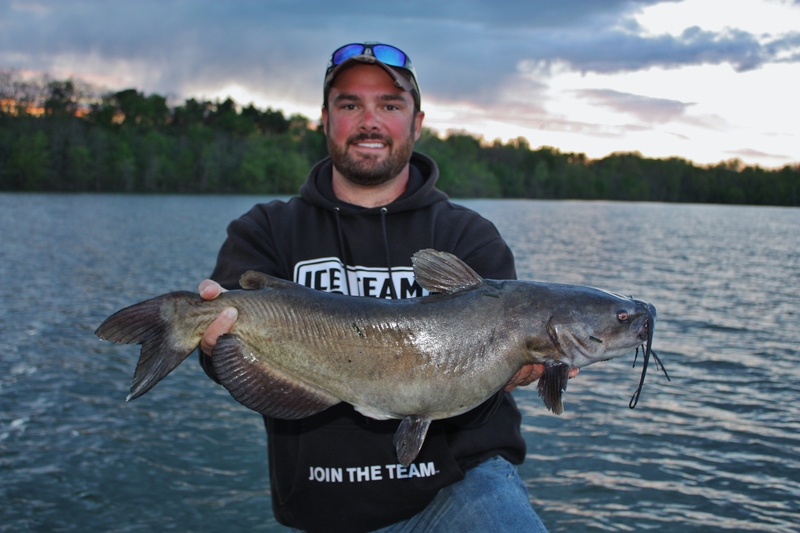 Too much and the fish aren’t active and the boat is difficult to maneuver. Lets not even mention the numerous jigs lots on the wood because of the current! Too little current results in no bait movement therefor no feeding by bigger fish. The main river current would be a concern for sure. Upon arrival to the small tributary where the launch was located, we knew it was going to be a chore to get the boat in the water. While launching, the current actually picked the boat and trailer up and pushed them against the dock. It was going to be an interesting day for sure. We got to the hot spot the year before and rigged up. The presentation of the day was going to be a 1/2 ounce jig tipped with a whole night crawler. The current always plays a role in the size jig we use, we try to use the smallest as we can get away with but I often times I like the heavier jigs when fishing vertically. It allows me to stay in touch with the jig better. It never takes long to know if the fish are on the wood and if they are feeding. By the 10th drop with no bite, I knew we were in for an unproductive morning. 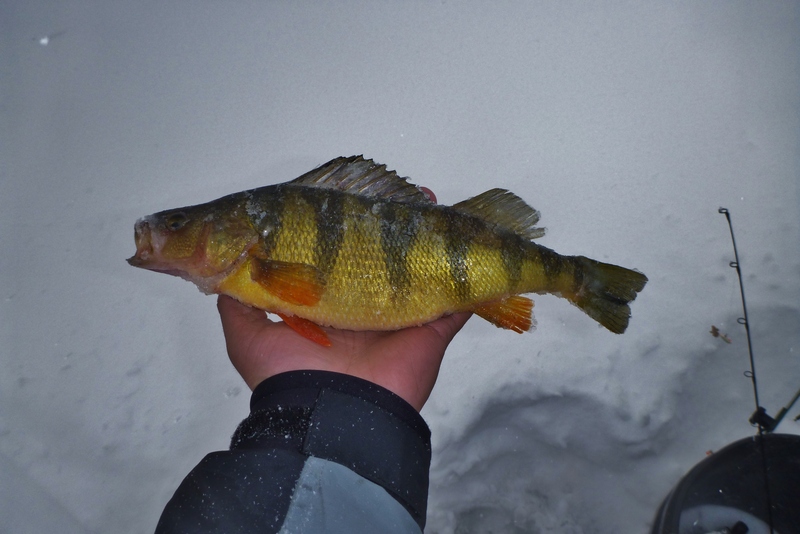 We stuck it out for a few hours anyways, landing one small walleye, a few small perch and a decent northern. With plenty of time left in the day, we made a short ride to a favorite inland lake of ours in attempt to hook up on a few bass. 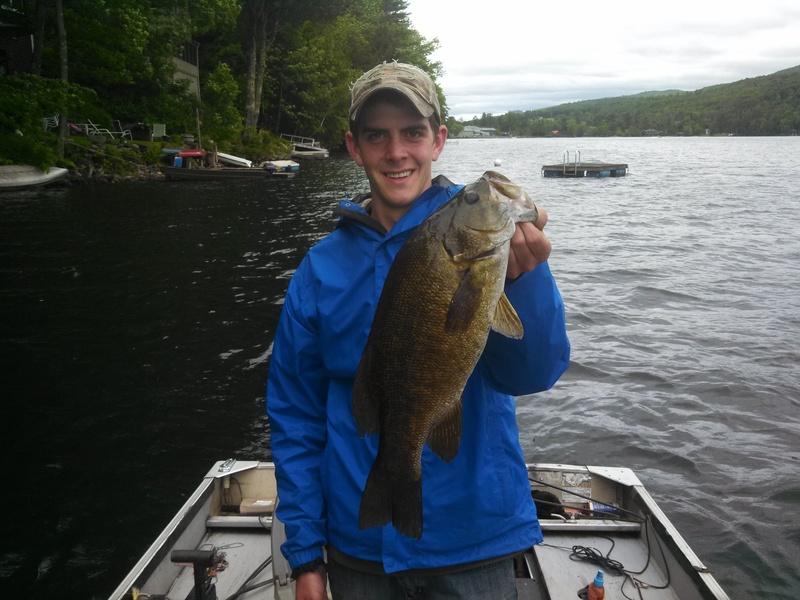 With the water temps where they were, we knew that the bass were in post spawn mode and should be feeding heavily. We armed ourselves with a drop shot set up and made our way across the lake that always seemed to produce numbers of quality fish. The plan was to fish the sharp drops with near by weeds. The fish were there and they were stacked in certain areas. Our presentation was slow, casting with a few bumps and bounces on the way in with many long pauses. The pauses is what seemed to trigger the fish into biting. We were able to have one of the better days I’ve had on this lake in a few years boating at least two dozen decent fish. Check out Drop Shot Bass on our YouTube page for more action! So a week ago I was down fishing for staging crappie (Chasing The Warm Water). We had some trouble staying on fish but only when the wind was blowing. When the wind would let up, the sun was warm enough to warm the water up enough to draw the fish out of the deeper, cool water and into the warm shallows. For this trip, we had a warm up over night that cooled down throughout the day. 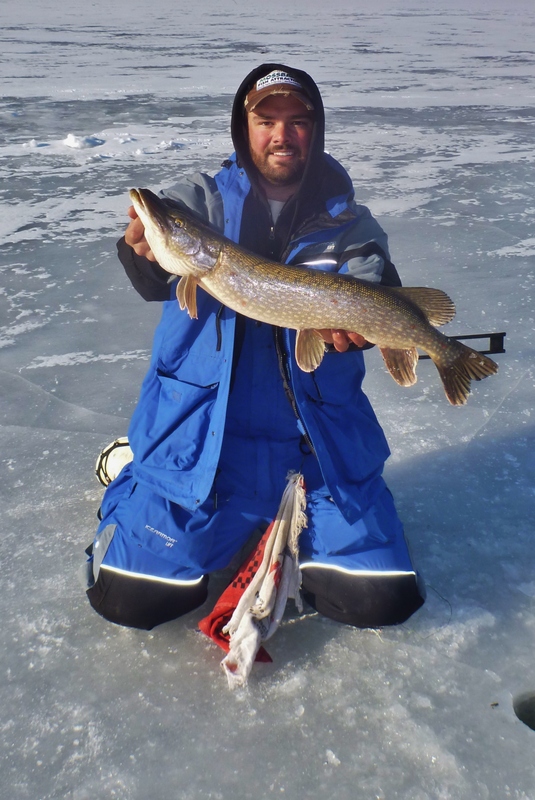 Some spots stayed warmer longer but not all held fish. We started the day where we had all the luck just a week ago. Cruising in, the fish were no where to be found were they were before but at the very end of navigable water, we found some. We picked about 15 fish before the wind switched on us and started to cool the water. Th e majority of the fish in there were small. Making radius casts around the boat, an osprey swooped down and grabbed a decent sized crappie from where we motored through to get in. We quickly hoisted anchor and got out to where the fish was taken from. No dice. The fish were either not there or completely inactive. Our best bet was to go searching. We checked several spots with no luck. We had trouble finding water that reached much more than 47 degrees. With the main lake in dismay because of the steady wind with gusts into the high 20’s, we came up with a plan that, if ineffective, would lead us off the water and to dinner. The first spot we checked appeared to be cold and vacant. We worked both shores, the middle, and then back towards the main lake. Nothing was happening until the it opened up. I pulled a fish out of rough water but lost it at the boat. 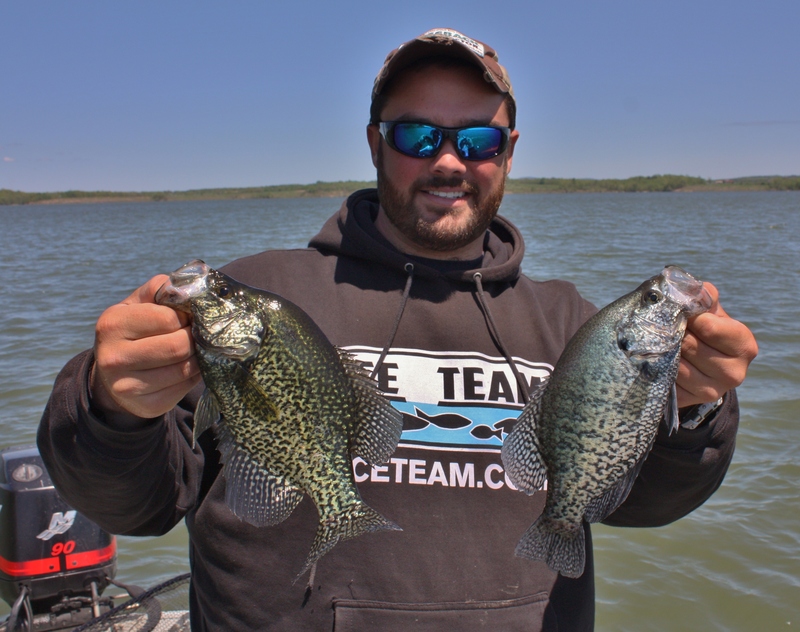 For the next half hour, we pulled some of the bigger crappie that I have seen so far this spring. They were coming out of 2 feet of water on a very slow drag. 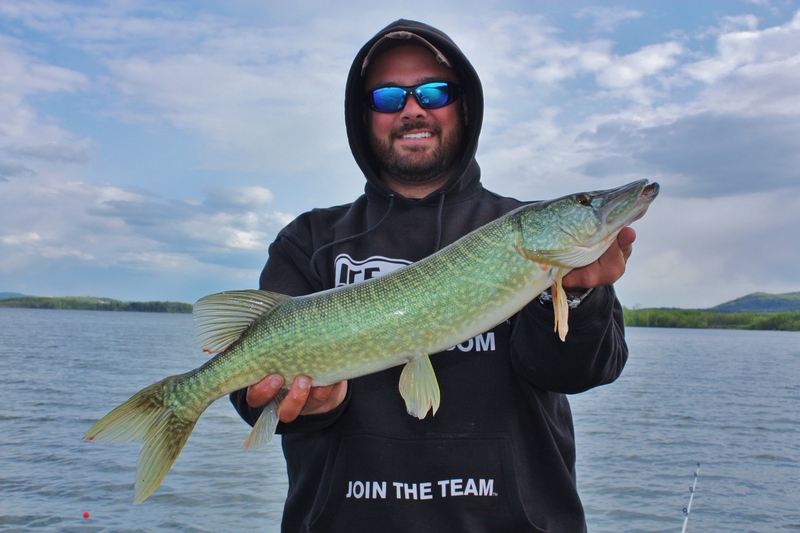 The hot bait for the day was a pearl Lake Fork Trophy Lures – “Live” Baby Shad. As the fish funneled by the wind started to pick back up and the water cooled a few degrees causing the fish to vacate the area. The best part of the day happened as we were about ready to leave. As my friend Jamie worked his bait in, a crappie rose up right by the boat and sucked his bobber in but then immediately spit it out. Within seconds, a bass followed up and grabbed the bobber again. Jamie started to pull it in unhooked but it was once again spit it out. Then believe it or not, a crappie had taken the bait underneath and was hoisted into the boat. The rest of the day was spent unsuccessfully searching for fish. Without a good idea of what else to do, we packed up the gear and made the rough run back to the launch for the drive back home.